Before horses and guns were introduced to Native Americans, hunting bison was a dangerous affair, the bison being quite aggressive and hard to kill. 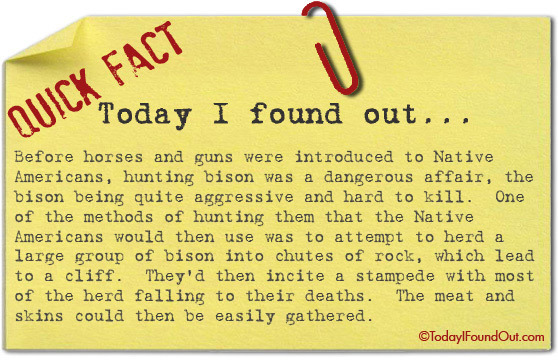 One of the methods of hunting them that the Native Americans would then use was to attempt to herd a large group of bison into chutes of rock, which lead to a cliff. They’d then incite a stampede with most of the herd falling to their deaths. The meat and skins could then be easily gathered.